Following in the footsteps of the University of Sydney’s first Olympian, Nigel Barker, who won the bronze medal for the 100- and 400-yard sprints in 1906, more than thirty students and alumni from the university community are competing at the Olympic and Paralympic Games in London. On day six, first year media and communications student Jess Fox took out the silver medal in the women’s kayak slalom with a score of 106.51, beaten by just 0.61 seconds. Engineering and IT alumnus Kynan Maley came sixth in the men’s canoe slalom. 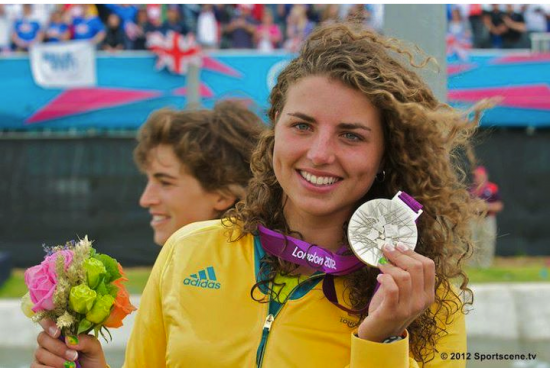 Brooke Pratley, a representative of the Sydney University Women’s Rowing Club, won a silver medal in the women’s double scull. Pratley is a physiotherapy graduate and former elite athlete scholarship holder. Another university alumna Kaarle McCulloch won a bronze medal in the women’s team sprint on the opening day of the track cycling. Representatives of the Sydney University Boat Club, Tobias Lister, Nick Purnell, Sam Loch, Francis Hegerty, Matthew Ryan, and Brodie Buckland came sixth in the Men’s Eight final. Buckland and his partner also came fifth in the men’s pair rowing final. Media and Communications graduate Loudy Wiggins competed with her partner Rachel Bugg in the finals of the 10m platform synchronised diving where they placed fourth.